If you need a quick and convenient blender to make smoothies, baby food, and nutrient-rich drinks alike, the Nutri Ninja BL490 is a good option to keep in mind. It comes with a high-power and high-performance motor that can make quick work out of pretty much any ingredient out there. Although the blender itself is not portable, the included cups with sip-and-seal lids are highly portable. There’s also the fact that the Nutri Ninja BL490 does not cost very much, a definite bonus. It is sleek, looks powerful and the bullet cups are great. It is low enough to fit under most counter tops. Smooth boost technology allows for a truly customized drink. The controls are easy to understand and use and using the bullet cups is easy. It is refurbished, but both the components and accessories are made from quality materials. Overall a well priced refurbished smoothie maker for both single on- the-go servings or smoothies for the whole family! One of the reasons why the Nutri Ninja BL490 is such a popular choice is due to its versatility. Now, if you like mixing icy smoothies, or just those at room temperature, this is a good blender for you. It has no problems mashing through frozen fruit and through ice too, thus making it a good option for a hot summer’s day. Seeing as the portable blender cups come included, it’s also a good option if you need to quickly make a smoothie in the morning to take to work with you. Sure, the large blender pitcher is nice if you have friends and family over, but the portable cups are what make the Nutri Ninja BL490 shine. It does take up a fair amount of counter space, plus it is very loud, but it works well and it doesn’t cost too much either. In other words, it’s a pretty inexpensive blender that works like a charm, but do keep in mind that it cannot handle dry ingredients or very hot foods. It’s for people who like cold or room temperature smoothies. 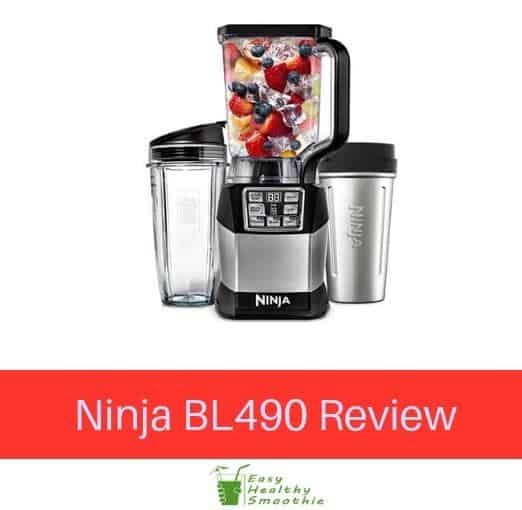 When you buy the Nutri Ninja BL490, you get the blender base itself, a 72-ounce pitcher for making large smoothie meals, and it also comes with 2 blender cups. This is quite convenient, as the blender cups can be attached right to the blender without needing to use the pitcher in between. Simply flip the cups onto the blender, blend away, take them off the base, and you can take the cups with you, lids and all. Here you can choose to get a new version or a refurbished one, with the new models having great warranties, whereas the refurbished ones will save you some money to begin with. As far as can be seen, even with the refurbished options, all of the lids, blades, and cups seem to be in great condition. When it comes to features, the Nutri Ninja BL490 does have a few of them which are worth mentioning. For one, it is quite versatile in the sense that it comes with something called Smooth Boost Technology. This setting allows you to make very smooth and creamy smoothies even when using frozen fruits and ice cubes. Here you can choose between high-performance blending for the smoothest smoothies around, or you can use the nutrient extraction mode to get the best health benefits from your ingredients. The Pro Extractor blades included here work wonders in terms of extracting the most valuable nutrients from your ingredients. In terms of settings, the Nutri Ninja BL490 comes with various pre-programmed settings, mainly the ones we just talked about above. Moreover, here you can also choose from timed modes and manual pulse modes too. One feature that we personally really like about the Nutri Ninja BL490 is that it comes with 2 ready-to-go portable cups. Both cups can be put right on the blender and then taken with you. One of the cups is stainless steel which keeps your smoothies cold for up to 4 hours, plus both cups also come with sip-and-seal lids, another convenient feature. Although it may be loud and cannot handle hot foods or liquids, the Nutri Ninja BL490 makes quick work out all kinds of fruits and vegetables, even frozen ones too. The Smooth Boost Technology creates some truly creamy drinks, and the nutrient extraction mode is great for getting all of your vitamins. This is a high-quality and fairly inexpensive blender that comes with portable cups for convenience.